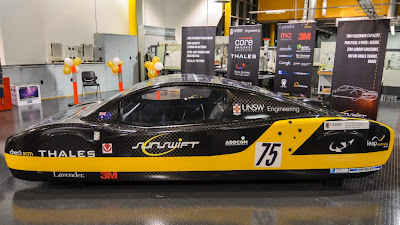 UNSW Solar Racing Team Sunswift revealed their solar racing car eVe at the University of New South Wales last Friday. The latest addition to the Sunswift family is designed for the new Cruiser class, which consists of four-wheeled vehicles that must meet regulations for normal roads-worthy vehicles in the country they come from. They’re also required to have both a driver and a passenger. 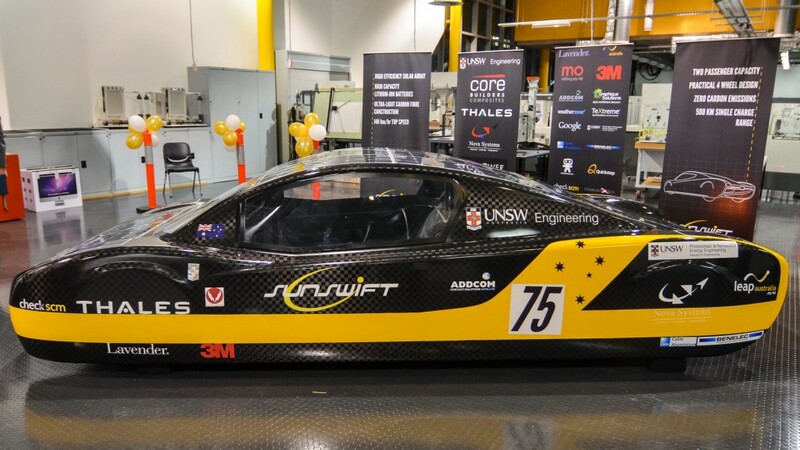 The new Sunswift racer is RWD and powered by 2x 1.8 Kw (10 Kw Peak) Australian developed direct drive CSIRO wheel motors, now manufactured under license by Marand Precision Engineering, giving a top speed of 140 km/h. 15 kWh worth of Panasonic cylindrical Lithium Ion batteries, weighing only 63 Kg, output 140 volts and give eVe a single charge highway speed cruising range of over 500 km, as much as the 85 kWh Tesla Model S! This incredible range is achieved by a combination of light weight (about 300kg) carbon fiber monocoque construction, extremely low drag coefficient, 98.3% energy efficient direct drive wheel motors and solar charging. 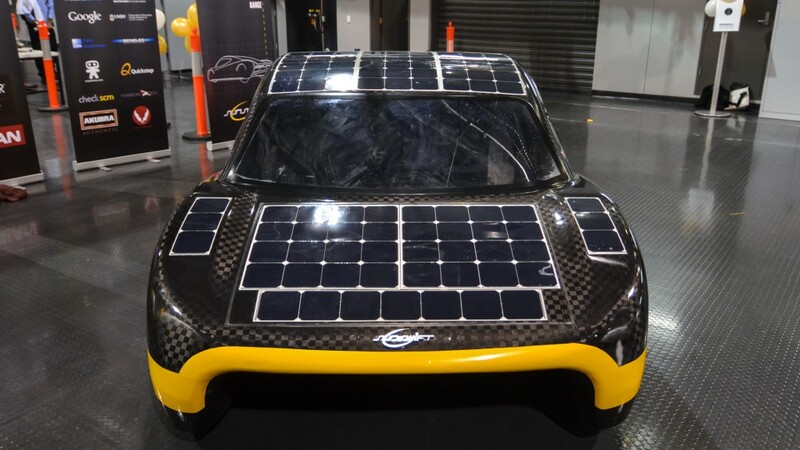 Battery charge comes care of continuous top-up from the PV cells, with opportunities for major fills from the grid at points in Tennant Creek, Alice and Coober Pedy. 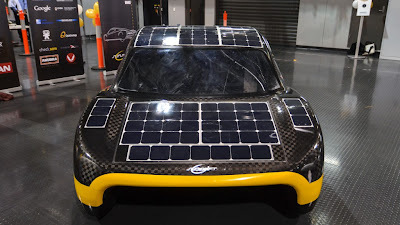 eVe has a 1800 x 4500 mm footprint (larger than a Tesla Roadster) with four square metres (WSC rules allow up to six square metres) of Mono-crystalline silicon cells provided by SunPower. 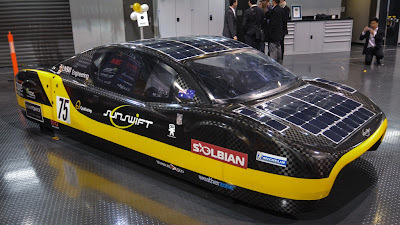 Although the new car has twice the frontal area of its blade-like predecessor, Sunswift has achieved a similar drag coefficient. 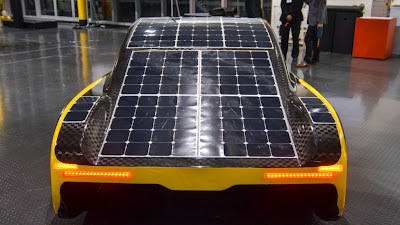 It’s managed this partly by the use of a smaller PV cell area, and partly through a unique high-set “tunnel” underside design, giving the car the look of a catamaran. 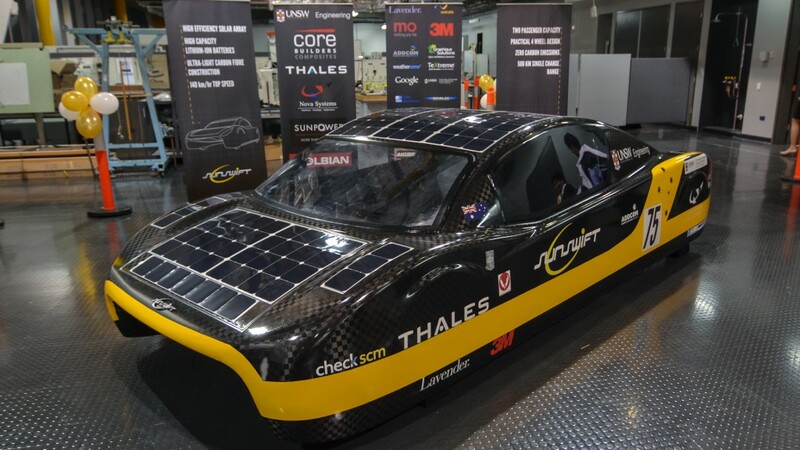 For the carbon fibre bodywork, Core Builders Composites in New Zealand, best known for its work on maxi-yachts of the calibre of Oracle’s America's Cup ocean racers, offered the team a sponsorship deal. The result is a structure of immense strength, with the only metal component a steel roll bar, there for compliance with FIA motorsport standards. 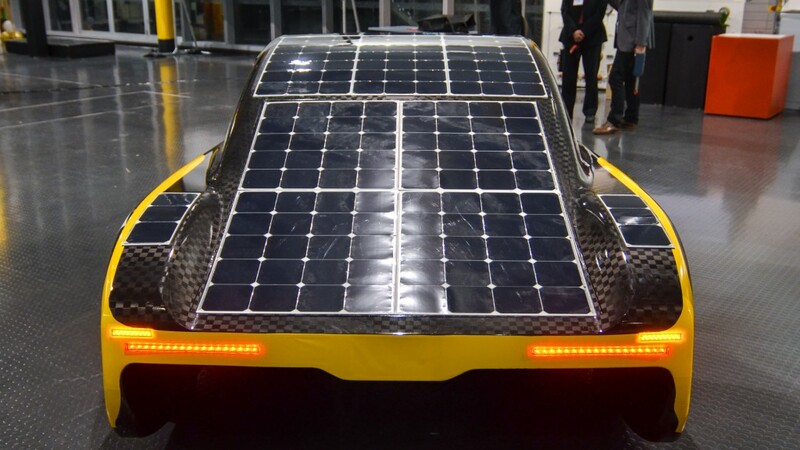 The team is looking towards a hi-powered version of the car using motors on all four wheels although to do so the team say the battery would need a significant upgrade. The Bridgestone World Solar Challenge starts on October 6th in Darwin and finishes 3,000 km later on Sunday 13th October in Adelaide. 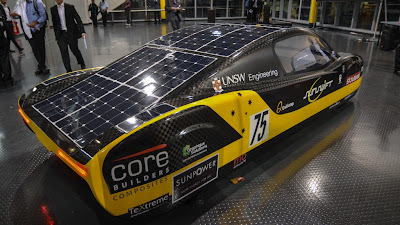 Disclosure: Post is sponsored by Bridgestone World Solar Challenge. Words and thoughts are entirely my own.